I’ve been looking forward to sharing these Chocolate Hazelnut Energy Bites for quite some time! They taste like a decadent dessert, yet they are full of healthy ingredients like hazelnuts, almonds, cacao, goji berries and mulberries. So if you are looking for your fix of antioxidants and fiber, look no further. Enjoy one of these energy bites as a dessert or an on-the-go snack! If you haven’t been able to tell from my recipes, I love chocolate and I love coconut. They should be paired together always! I also love dates. Hello, remember these Oat and Quinoa Date Squares? So, with these loves in mind, I try to find as many ways as possible to incorporate chocolate, coconut and dates into my recipes. 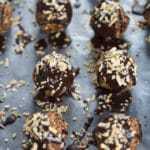 And when I need a quick and easy dessert for myself, and there is nothing in the freezer I can quickly defrost, I usually resort to a handful of dates, coconut chips and a few dark chocolate chips. This actually makes a great combination for packed lunches or travelling! For these Chocolate Hazelnut Energy Bites, the chocolate must be dark (the darker the better! ), the coconut must be toasted (or coconut chips – yum! ), and the dates must be medjool (unless you ate all of your medjool dates (like me), in which case, dried dates are perfectly fine)! I’ve made so many variations of these energy bites over the past few months but these Chocolate Hazelnut Energy Bites are, by far, my favorite. The base ingredients never change. The almond butter and dates are the ‘glue’ that keeps everything together. As long as you keep the base the same, you can substitute any number of dried fruit and nut combinations. I may be biased, but I think the combination of dried fruits and nuts in these Chocolate Hazelnut Energy Bites are absolutely the best. The goji berries and mulberries are not too sweet and they add a nice chewy texture. Plus, they have antioxidant properties! The almonds, in my opinion, are a staple in any energy bite, ball or bar 🙂 . And the hazelnuts, well, I chose these for their flavour, but they are a great source of fiber too. 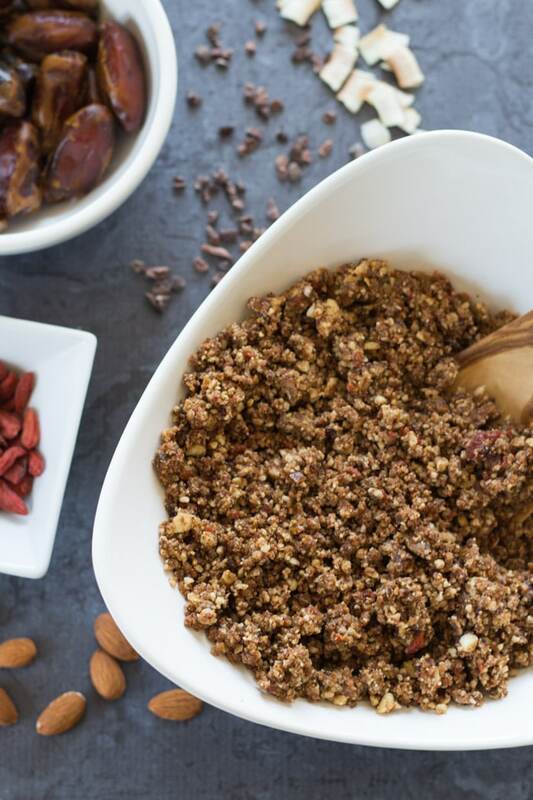 The hazelnuts are definitely the standout ingredient in these energy bites! Before adding the hazelnuts to the other ingredients, I toasted them in the oven for about 5 minutes. This was just enough time to bring out the flavour of the hazelnuts, but not enough time for them to fully brown or for the skins to come off. (I wanted the skins on for colour and texture). The toasted hazelnuts also pair nicely with the raw cacao nibs in this recipe. And, of course, cacao nibs are a good source of antioxidants too! In addition to the cacao, these Chocolate Hazelnut Energy Bites also have a outer layer of dark chocolate. While I poured a spoonful of melted chocolate over each energy bite, you can fully dip them in chocolate, or pass on the chocolate altogether. They taste great either way. I decided to pour the chocolate over these energy bites for two reasons. One, I just didn’t have the patience to dip 20 energy bites in chocolate, and let the chocolate drip off each one. Pouring it on was super quick, and at the end of the day, it really has the same taste effect! (Plus, there were little pieces of chocolate left on the wax paper that I could munch on after 🙂 ). And two, an energy bite fully covered in chocolate can be messy. By leaving the sides chocolate free, these bites are less messy and easier to handle, which is essential for an on-the-go snack! Am I right?!? 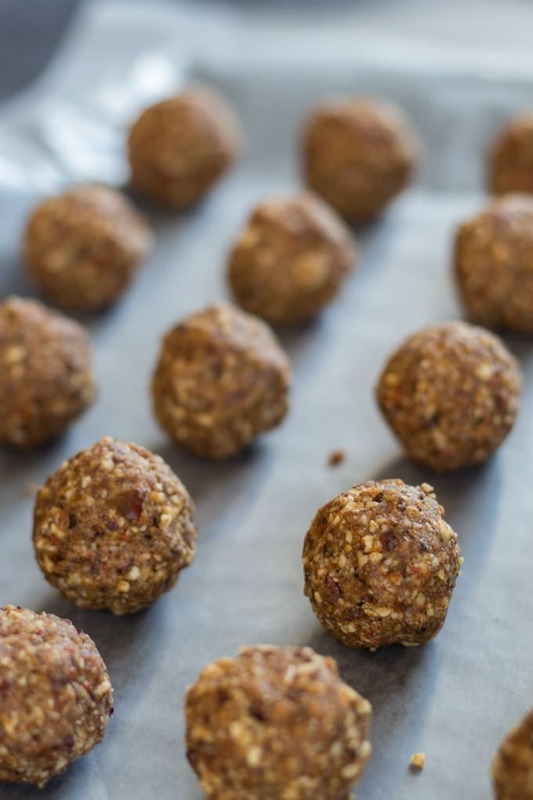 These Chocolate Hazelnut Energy Bites quickly come together in the food processor. Just add the ingredients and process on high for 3-5 minutes or until a crumbly mixture forms. You want the ingredients blended enough so they stick together, but with some little chunks of dried fruit and nut remaining. Once you reach the ideal texture, remove from the food processor and roll the mixture into 20 bite sized balls (about 1 1/2 inches in diameter). Now, the choice! You can eat these right away (or forget rolling and eat the crumbly mixture with a spoon, which I may have done!). Or, if you are coating these Chocolate Hazelnut Energy Bites in chocolate, I suggest placing them in the freezer for an hour. Freezing the bites first will firm them up and help the chocolate set quicker. 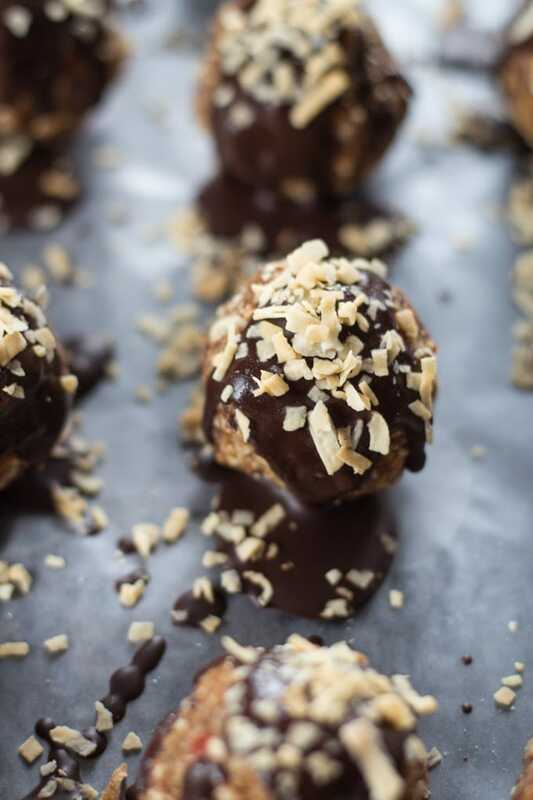 For this recipe, once I removed the bites from the freezer, I quickly poured melted chocolate over them, and then quickly sprinkled the toasted coconut on them before the chocolate set. 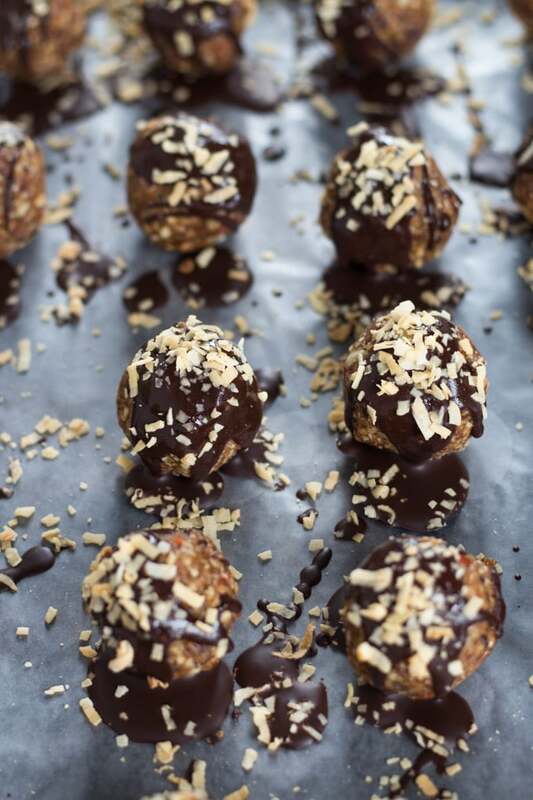 If you plan to dip each ball into the chocolate, I suggest adding the coconut after you dip each one. This will ensure the coconut sticks to the chocolate. If you make these, let me know if prefer them with or without chocolate! Chocolate Hazelnut Energy Bites have a decadent taste but are full of healthy ingredients like hazelnuts, almonds, dates, cacao nibs, goji berries and mulberries. In my opinion, this is the perfect clean eating dessert recipe! And with lots of antioxidant ingredients, fill free to enjoy these as an on-the-go snack too! To toast the hazelnuts, pre-heat the oven to 350 degrees. Place the hazelnuts on a small cookie sheet and bake them in the oven for 5-10 minutes. 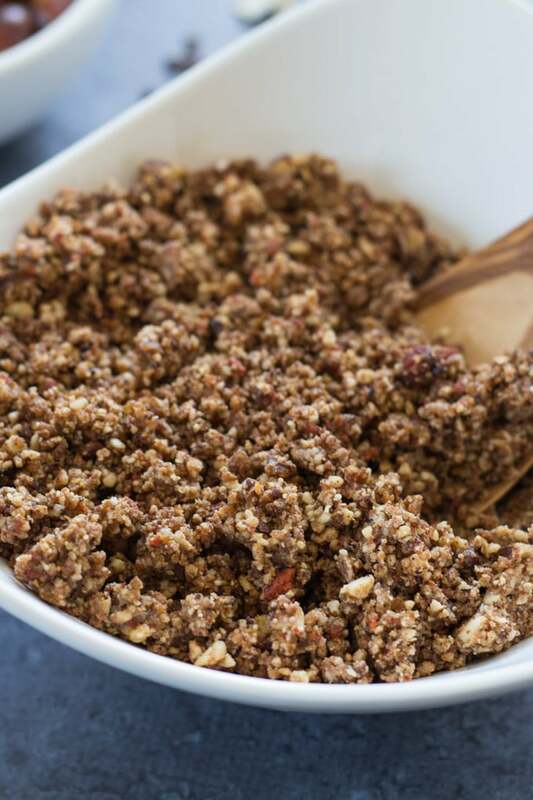 Once toasted, add the hazelnuts to the food processor along with the dates, almond butter, almonds, goji berries, mulberries, cacao nibs, coconut chips, vanilla and cinnamon. Process the ingredients on high for 3-5 minutes, or until a crumbly mixture forms. There should still be some chunks of dried fruit and nut in the mixture, but it should be sticky enough to form into balls. Roll the crumb mixture into 20 balls about 1 1/2 inches in diameter and place on a wax paper covered cookie sheet. Place the energy bites in the freezer for an hour, or until frozen. Before removing the bites from the freezer, add the dark chocolate and coconut oil to a small sauce pan and melt over a low heat (stirring often). Remove the bites from the freezer and pour a spoonful of melted chocolate over each bite. Lightly sprinkle with toasted coconut. Place the bites back in the freezer until the chocolate has set. 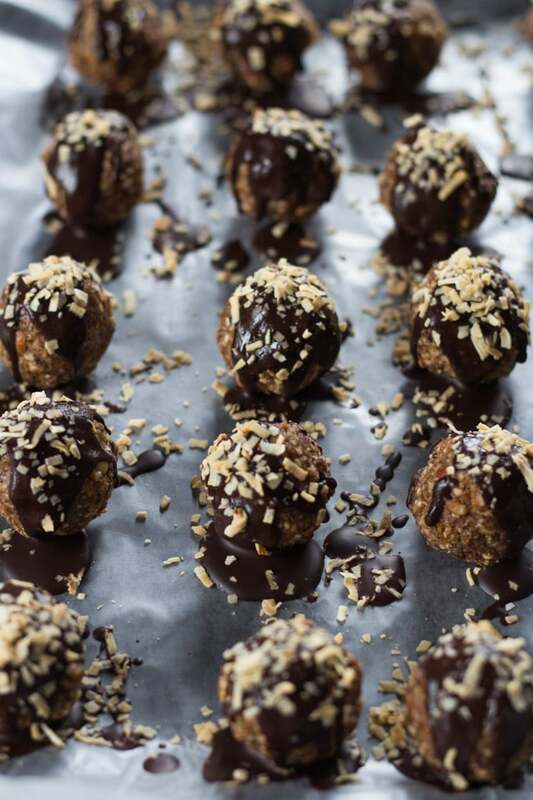 Store these Chocolate Hazelnut Energy Bites in an airtight container in the fridge for 5-7 days. You can also store them in the freezer for 2-3 months. When you remove them from the freezer, just let them sit at room temperature for 5 minutes before enjoying them! Lightly toasting the hazelnuts will bring out their flavour, however, you don’t want them to brown too much. So just keep them in the oven for 5-10 minutes at 350 degrees and keep an eye on them so they don’t burn. I found these energy bites to be delicious…thanks. Love these energy balls! Easy to make and I found all the ingredients at Bulk Barn. Thanks Cheryl. I’m glad you are enjoying the recipe! Oh you got two of my absolute favorite flavors going on here. Chocolate and hazelnuts. Can’t wait to try these! Thanks Neha! Chocolate and hazelnut is definitely a great combo. I hope you get a chance to try them. Be sure to let me know if you do!